OH NO! OPEN CALL schon vorbei?? Und ich wollte doch noch… mist… null Problemo: Auch in diesem Jahr gibt es eine Verlängerung. Bis zum 15. Oktober 2015 habt Ihr noch die Gelegenheit, das Papergirl Projekt mit Eurem Beitrag zu bereichern. Also, ran ans Werk! 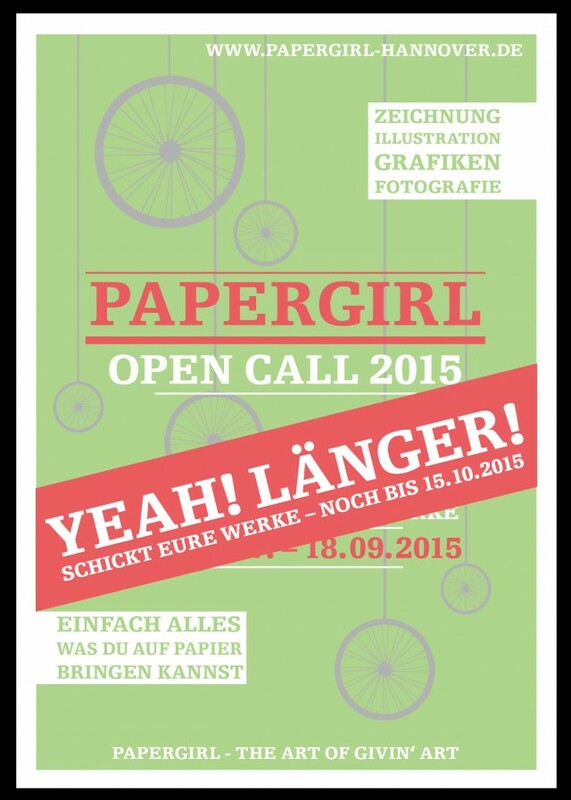 Papergirl Hannover braucht Euch und Eure Kreativität! Papergirl ist kommunikativ. Papergirl verbindet. Auch international. Den Beweis dafür zeigt die PersonalPapergirlStory von Luiza aus Sao Paulo, die uns 2014 über Facebook schrieb, nachdem sie von dem Projekt auf ihrer Timeline erfahren hatte: Sie sei gerade in Europa unterwegs und wolle uns besuchen, um uns zu unterstützen. Und das hat sie dann auch gemacht. Es war einfach toll, das Gefühl, dass man sich durch ein Kunstprojekt international kennenlernt und unterstützt. The first time I heard about the Paper Girl project was in 2009 and I was studying for my college final presentation, for my Graphic Design graduation. It was a research about the trend of Collaborative behave and the Paper Girl Project and the way they collect, show and spread art makes me fall in love. In fact, the group that made the no-paper-girl action got so exited about the experience of make real the first action that we decided to create a Collective, the RAW Collective (Coletivo CRU in Portuguese. find more about it at coletivocru.co). With the RAW we worked for more then 4 years organizing lots of things related to the cycle culture and appropriation of public spaces. I’ve really had changed after the RAW in my live, and all of this because of what the Paper Girls around the world inspired on me. I hope you are all great. My name is Luiza, I’m from Brazil but I’m living at London by now. 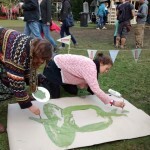 So, I’m in love with the PaperGirl project since 2009, when I discovered it researching about collaborative projects. I really want to make part of it this year with you guys. I hope we can do something together this year! Than we organized a meeting in Hannover to discuss what to do. I was so exited about be part of a real Paper-Girl Project that I wrote ideas for our meeting almost all the road to Hannover. For my surprise, there was a journal interview going on at the same day of our meeting. 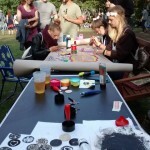 The point was that the Paper-Girl Hannover didn’t get many art products for 2014 edition, but we were almost closing partnership with a culture festival, the Fuchsbau Festival. We proposed to organize an artistic dynamic, with paper, inks, pens, rubber cutting and other stuffs. It was a totally successful day (despite the rain at the afternoon) my brain got a bit tired because of translating my impressions about Paper Girl all day long, in english, for germans. But my tiredness was so much smaller than my happiness after my Paper-Girl day with Zarah, one of the Hannovers team. I was recording all my european trip with a Go-Pro camera and, even not being a video-maker, a did a short clip of the Paper-Girl action at the Fuchsia Festival 2014. Personally, Paper Girl is more then the art of giving art. For me, it is about kindness and generosity. 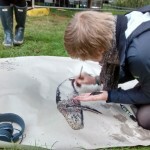 It is a project that promotes the art and the artists spontaneously. More then this, it is a tool to communicate with art with anyone, does not matter gender, age or any kind of orientation and beside this, it is a tool for horizontal access to culture and contemporary art, the art inside and out of the gallery at the same time. The art everywhere, from any artist, to everybody. How to don’t fall in love? How to don’t feel yourself inspired with it? Was an indescribable pleasure to be part of Paper-Girl Hannover 2014, a project that always was my personal icon of art project, the project the made born my lovely RAW collective and made me travel to German, the country where the project started, to finally be part of the super fantastic Paper Girl Project. I was eating, breathing and drinking the paper-girl at those beautiful weeks of my life, even more then the others 5 years before, since I started to follow the paper-girl philosophys. 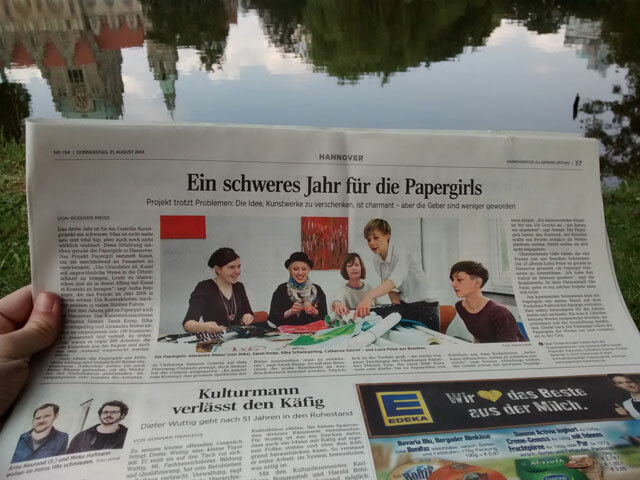 Many thanks to the Paper-Girl Hannover team. I miss you, girls! Many thanks for everybody that keeps the project alive. You are the best!